The Canadian National Exhibition has a week left. Of the 132 years of The Ex's existence, I worked a game booth across from The Polar Express every day it was open for three of 'em: 1989, 1990 and 1991. If you read nothing else in my 10867 entry archive, read those CNE entries. Trust me, you'll never look at a carnie the same way again. 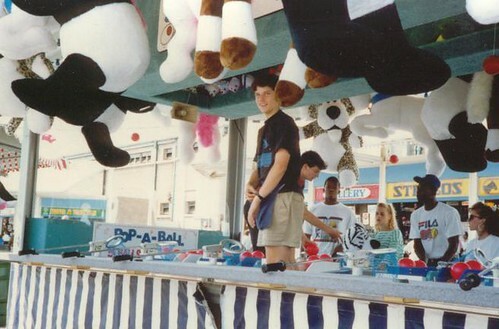 This is likely the only picture of me working that game booth at The Ex. The lack of Bart Simpson dolls tell me this is the summer of 1989. The annual tradition lives on. That photo haunts me. On a related note, an early memory i have of the CNE was many years ago where they still had freak shows. I went to some sort of Fat Man exhibit. So very sad. Everybody walks up stairs and you stare down at this very obese, sad looking dude sitting at the bottom watching a crappy black and white tv. Occassionally one of the people looking at him would throw some dough down at the guy, and he'd look up, and boy did that guy look effed up. 1989..More important whom was the skank from Etobicoke that took the pic..Cathy or Karen?? Clearly photo is 22 years old. Now today in 2011 would you turn your back on two brothers with 2 white girlfriends? we all have to be correct. Turns his back on a bro cuz he dates a whitey.